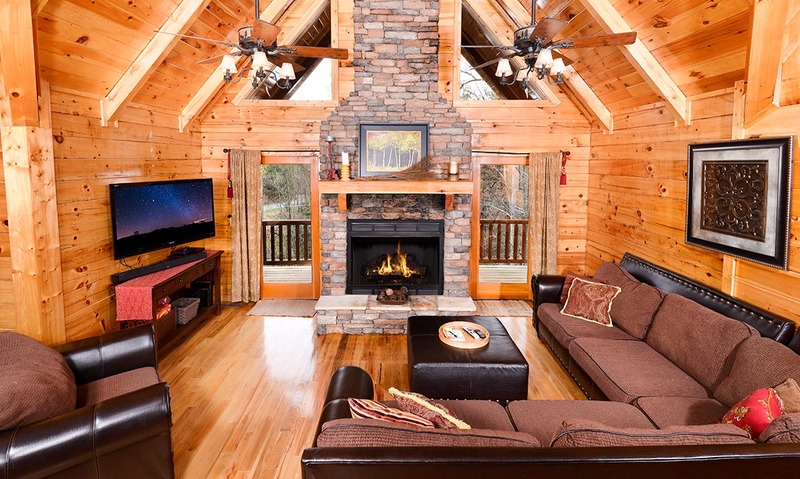 Lifetime friends and close-knit families, The Great Escape welcomes you to cozy evenings by the fire, game nights in the rec room, and memorable mornings with a cup of coffee and whimsical woodsy views. 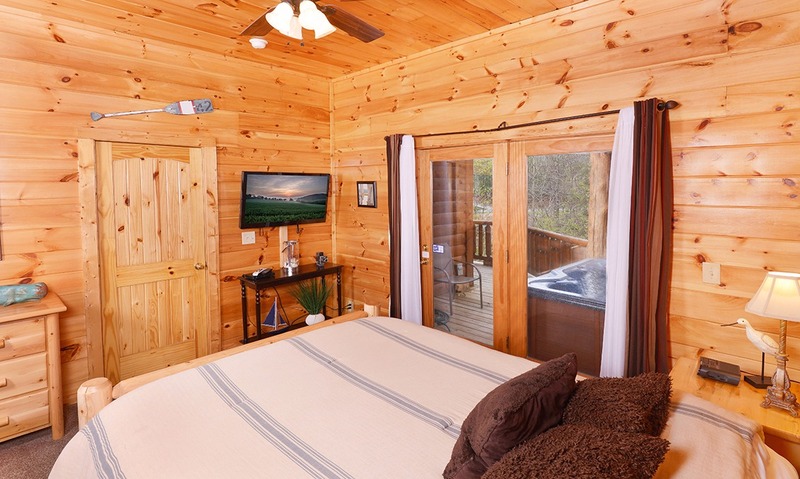 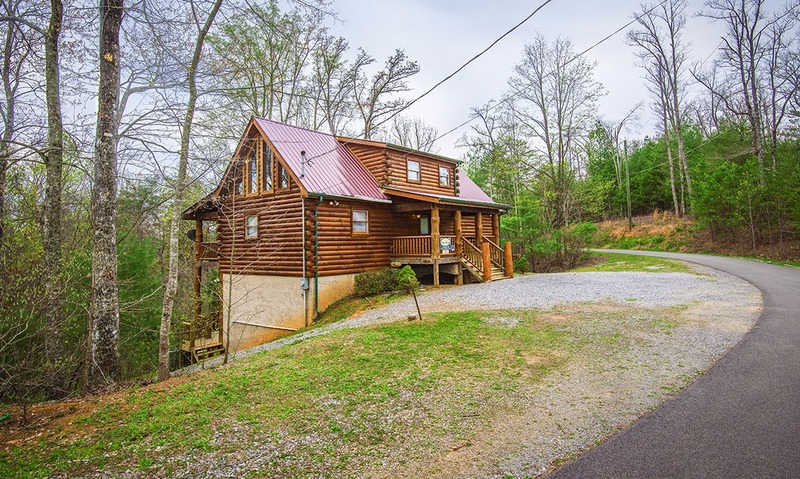 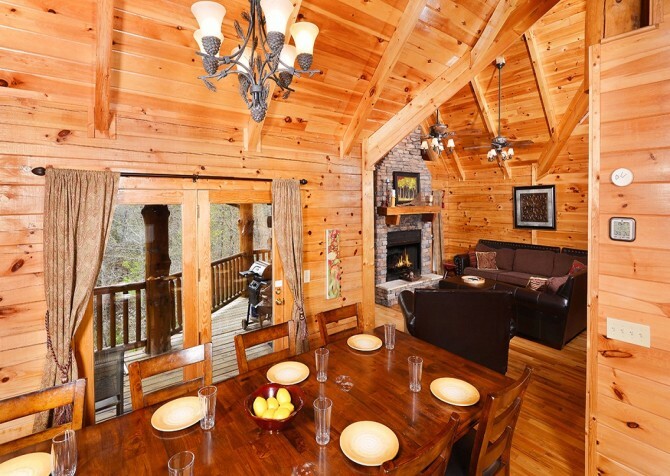 Located in Pigeon Forge, Tennessee, this log cabin for up to 8 guests features 4 bedrooms, 4.5 bathrooms, a fully equipped kitchen, and 3,000 square feet of space to hang out, watch movies on the big screen TVs, and play hide-and-seek with the kiddos. All the comforts of home, including a washer and dryer, complimentary Wi-Fi, and spacious rooms, blend with bonus amenities, like a pool table, arcade unit, and an outdoor hot tub, to provide a top-notch vacation for YOU! 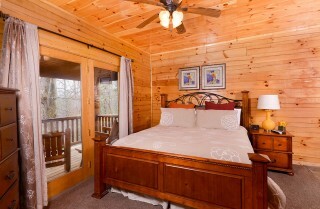 Get away from it all and create lasting memories along the way with a fun and relaxing stay at The Great Escape! 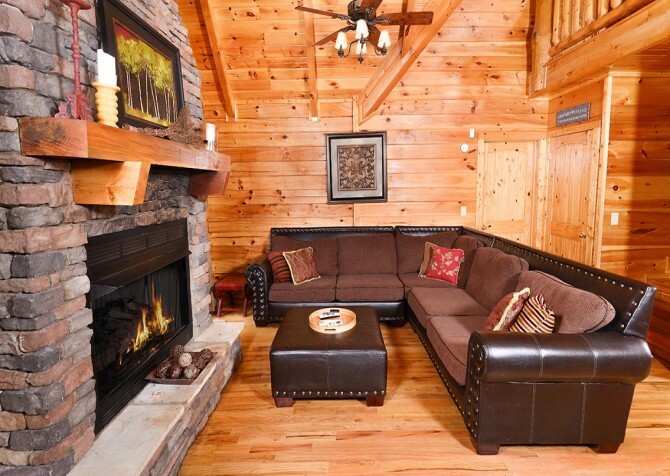 After a hearty meal downtown, head to the inviting living room with high ceilings, hardwood floors, and large windows to unwind. 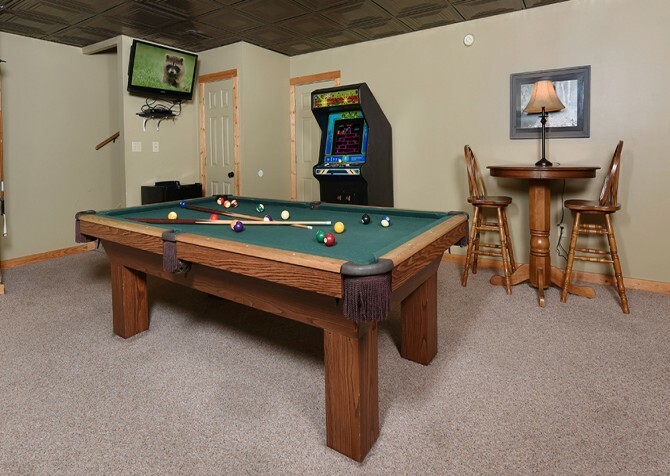 The large sectional offers plenty of comfortable seating, and the matching ottoman offers a great space for playing card or board games bought in town. Curl up by the stacked-stone gas fireplace on frigid evenings, and when summer settles in, switch on the ceiling fans to keep cool. Ready for a movie marathon? Pop in your favorite DVD, flip on the big screen TV, pass out bowls of buttery popcorn, and press play! 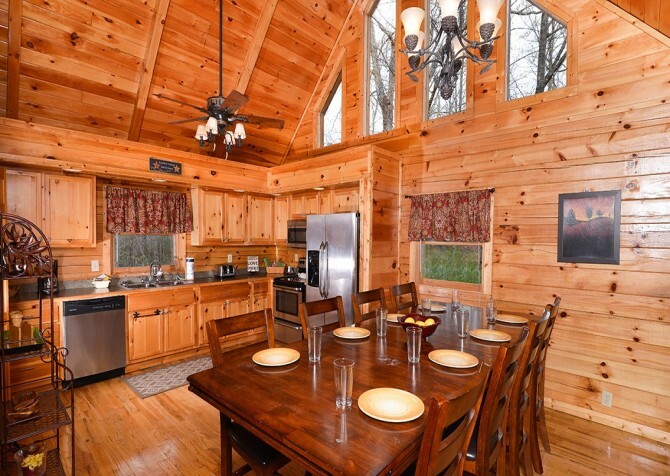 If you prefer homecooked meals, this lovely Pigeon Forge cabin provides a fully equipped kitchen, ready for whipping up delicious meals in a flash! 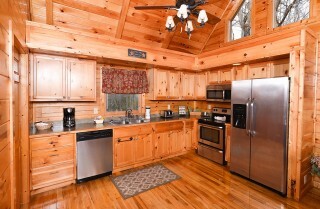 The warm wood cabinets exude cabin charm, and the stainless-steel appliances add an touch of luxury. Vaulted ceilings with large windows let in plenty of natural light, and the space boasts an open concept, so you won’t feel cramped while you cook. 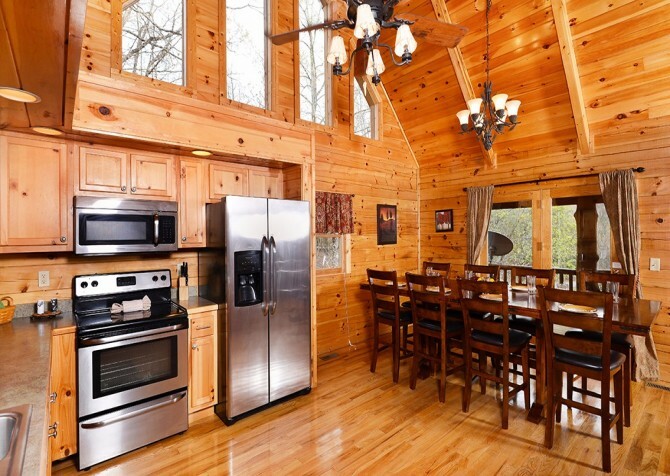 Brew endless pots of joe, prepare a game-day spread, bake cookies with the kiddos, and make wonderful family meals to enjoy at the nearby dining table. Seating 8 guests, the dining table has room for everyone sleeping in the cabin. 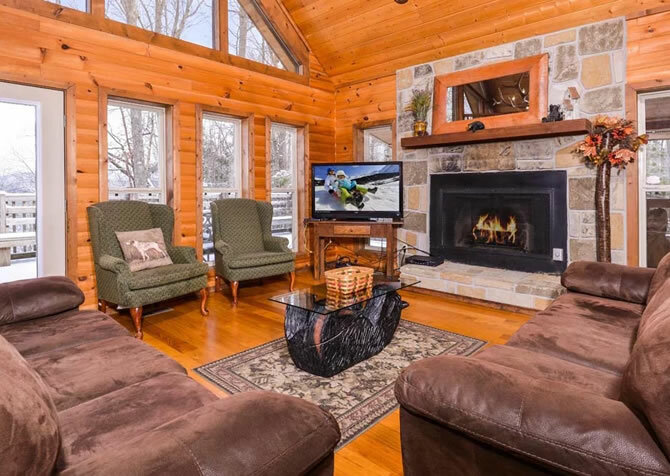 Being open to the comfortable living room, you can enjoy meals and snacks with some sitting in the dining area and others hanging out in the living room. 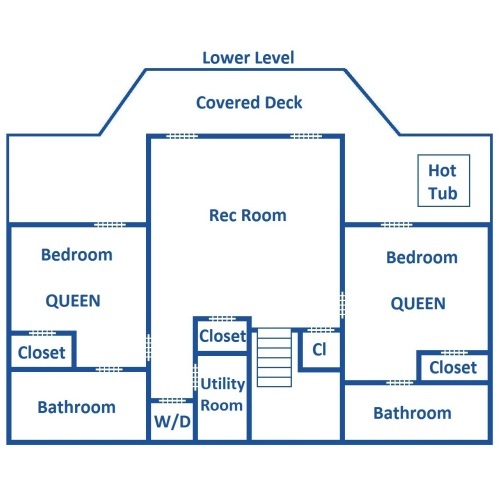 When mealtimes are over, set out coloring tools for the little ones or deal out a fun game of cards. 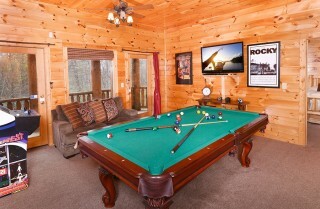 Another great place to escape is the game room! 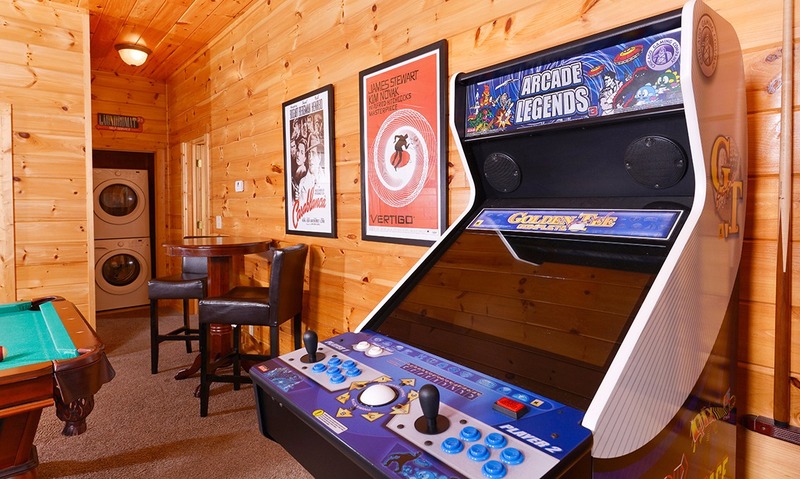 Boasting a big screen TV, a cozy love seat, a pub table for 2, a pool table, and an arcade unit, this rec room is perfect for kids and kids at heart. Watch feature films, show your family who’s boss at pool, knock back a few cold ones with your friends, and cheer on your bestie to beat the highest arcade score! At the end of each night, hit the hay in one of 4 comfortable and spacious bedrooms. 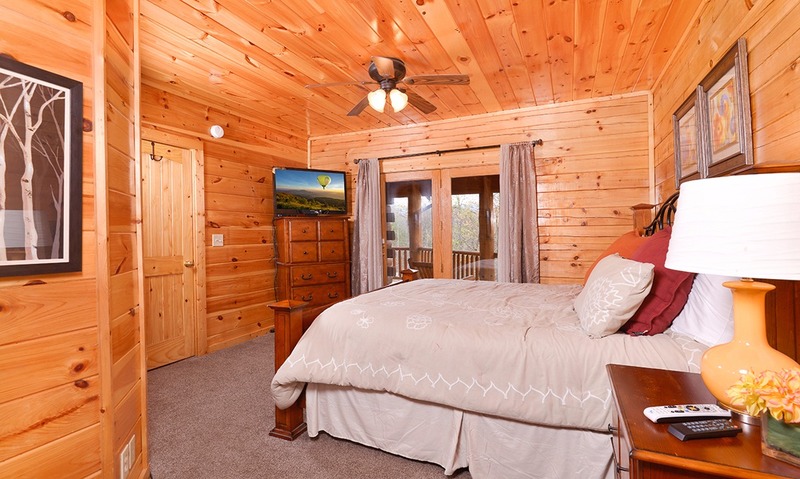 You’ll find cozy bedding, lovely décor, a ceiling fan, and a flatscreen TV in each bedroom. 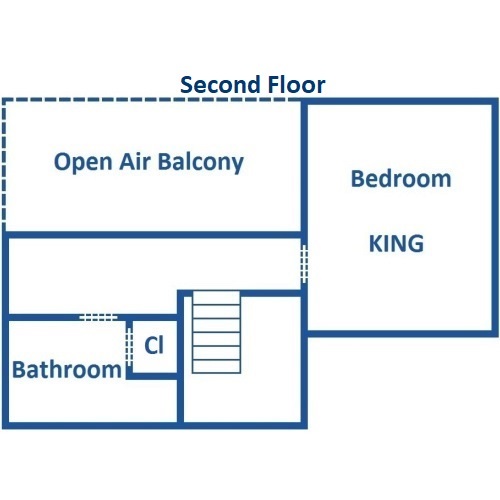 On the lower level, 2 queen bedrooms feature their own private en-suite bathrooms with garden tubs, and the entry level bedroom (with another en-suite bath) and loft bedroom boast king-size beds plus indoor jetted tubs. Not to mention, there’s another full bathroom in the loft and a half bath on the entry level — getting ready will be a breeze! Start the day with a refreshing spa bath or sleep in and enjoy the quiet of the mountains. 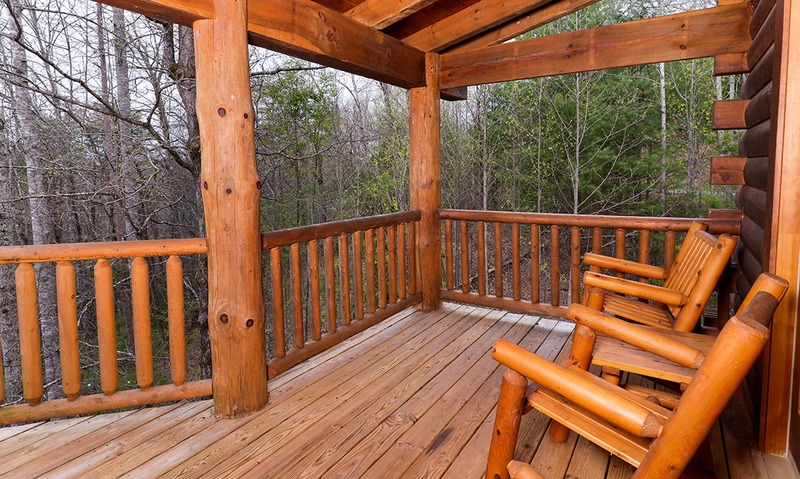 Before heading to bed, spend some time in the great outdoors on the charming decks of this secluded cabin. 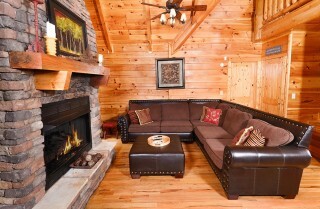 Sit back in the log chairs and enjoy hot chocolate on cool eves or a large glass of ice-cold lemonade on warm nights. In the mornings, enjoy the peace of the wooded views as you breathe in the fresh mountain air. 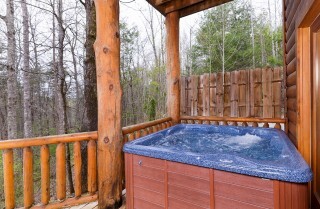 And when afternoon strikes, soothe aching muscles from your mountain hike in the steamy hot tub. 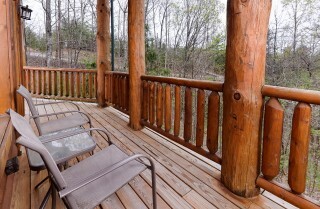 Ready for a barbecue feast? Fire up the gas grill for juicy steaks and chargrilled veggies! 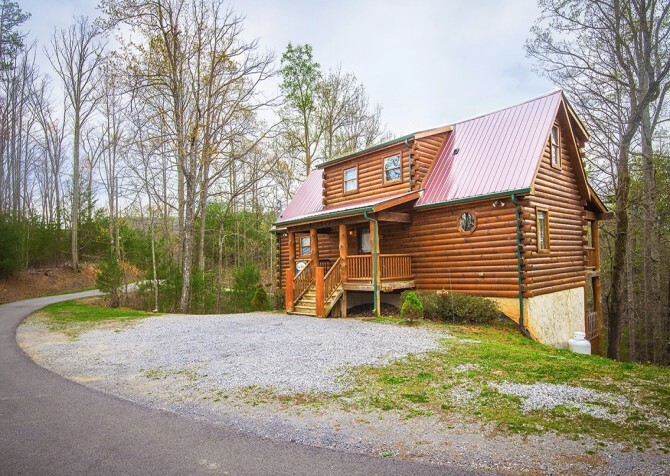 When you’re ready to paint the town red, the flat, motorcycle-friendly driveway makes things a little easier. 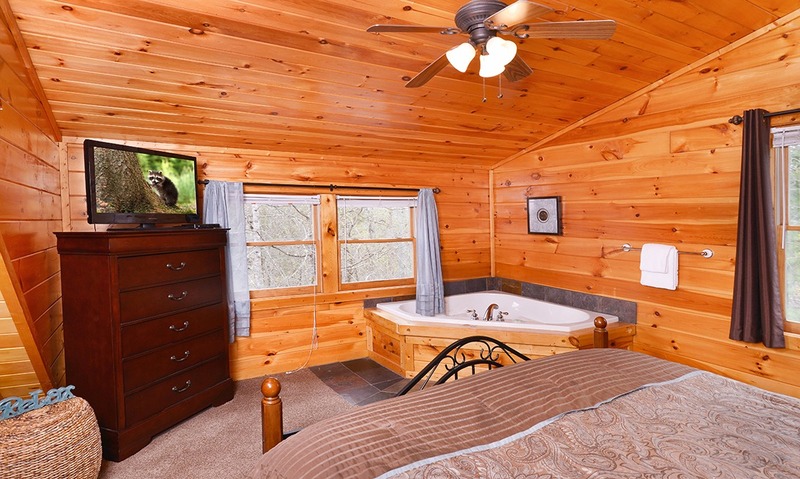 Plus, there’s room for 4 vehicles, so you don’t have to cram everyone into one car. 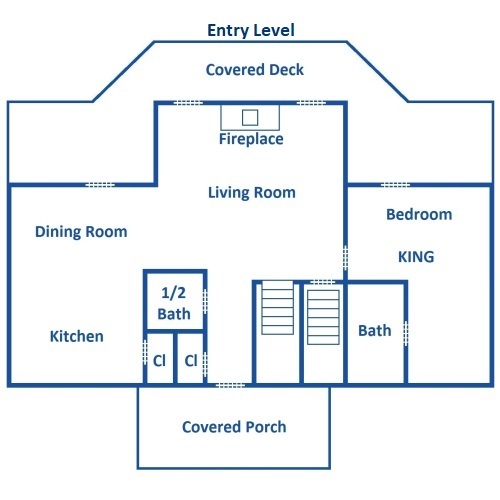 And with only 6 steps into the home, you can play as hard as you like downtown and not worry about trucking up a flight of stairs when you return to The Great Escape. 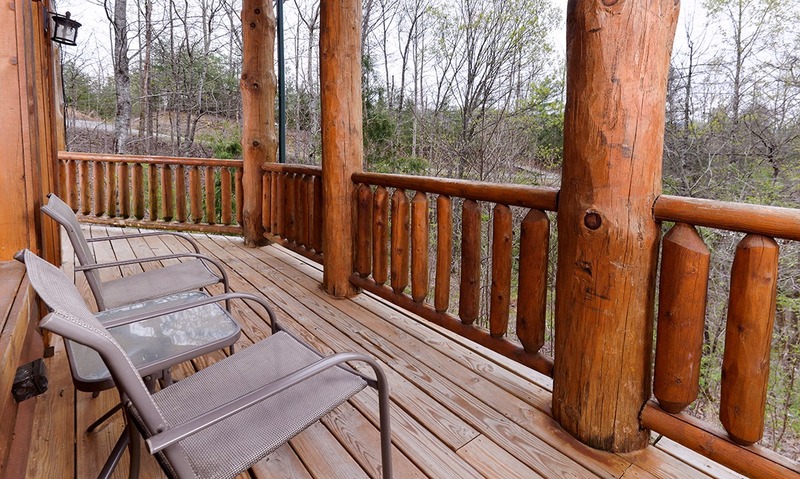 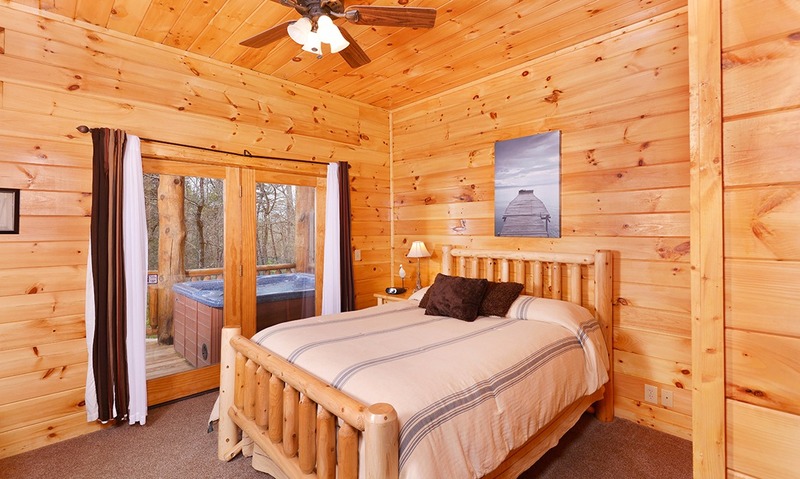 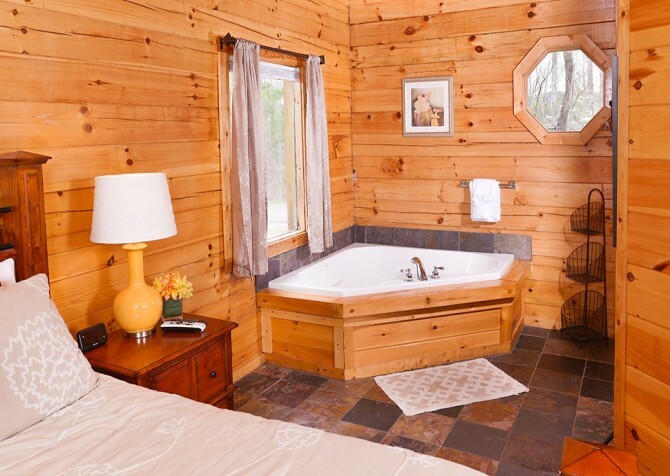 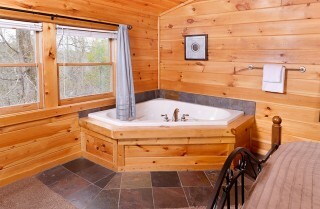 Other conveniences at this beautiful Pigeon Forge cabin include complimentary Wi-Fi and a washer and dryer. You’ll find yourself pampered with the bonus amenities, but you’ll love having all the comforts of home. 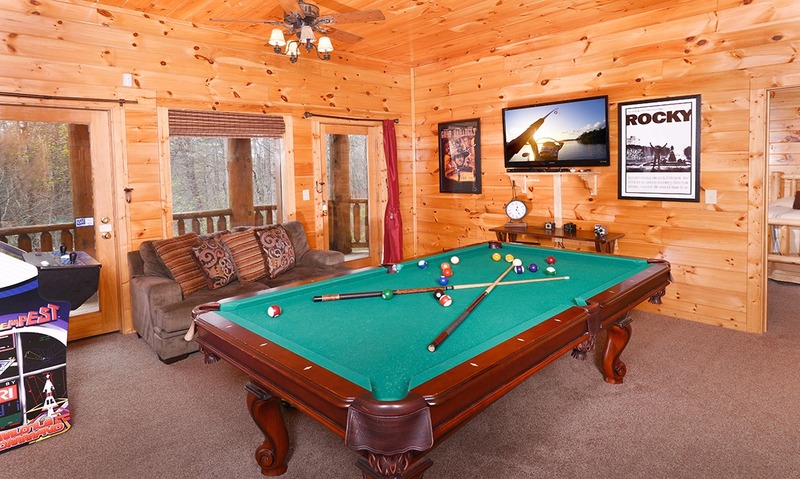 Located conveniently between Gatlinburg and Pigeon Forge, The Great Escape is not too far from these exciting towns but still tucked away, quiet, and private. 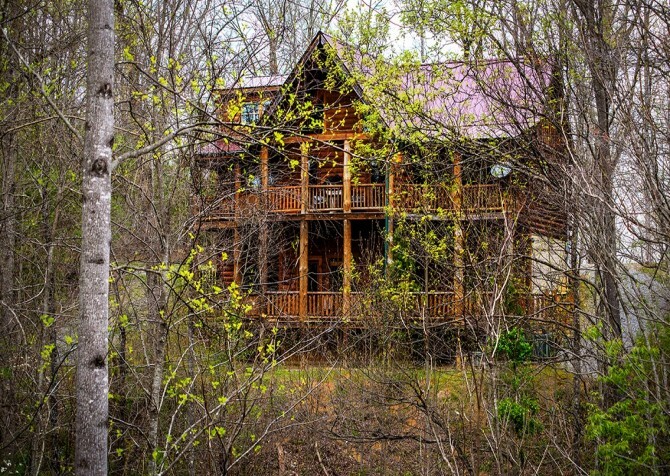 Pigeon Forge is less than 14 miles away, offering plenty to do, see, and eat. 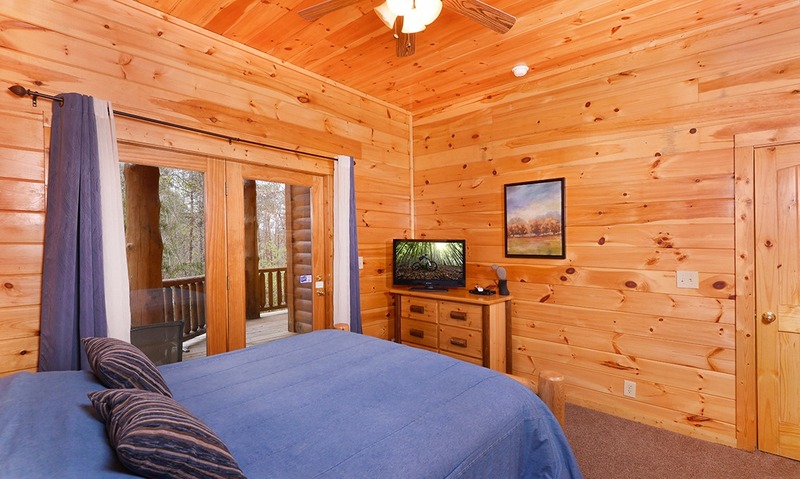 Family-friendly attractions line the Parkway and provide fun things for all ages. 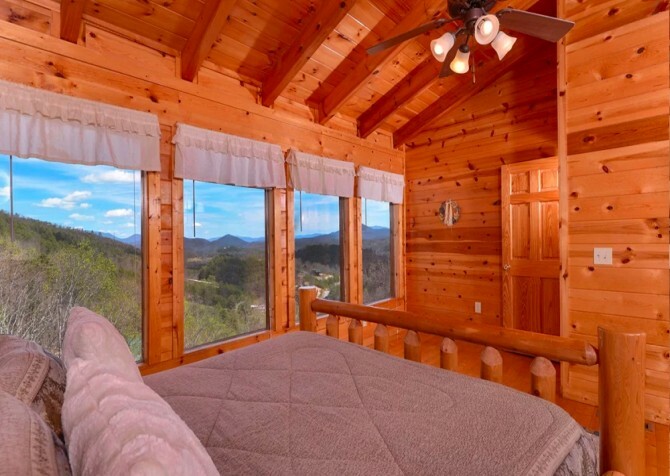 Catch a dinner show, check out the Hollywood Wax Museum, or visit The Island to shop, ride The Great Smoky Mountain Wheel, or wine and dine. There are also lots of places where you can ride go karts and play miniature golf, arcade games, or laser tag. 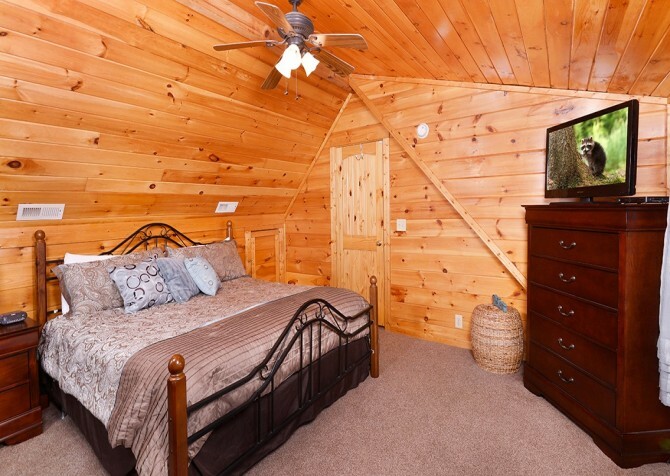 Whether you’re traveling with kids or you’re just a kid at heart, you’ll have tons of fun visiting this exciting mountain town. Outdoor adventures await at Foxfire Mountain Adventure Park, featuring a rope jungle, ziplining, hiking trails, and tasty treats! Zip over the Smoky Mountain landscape at Legacy Mountain Ziplines, where you can see the world at new and great heights! 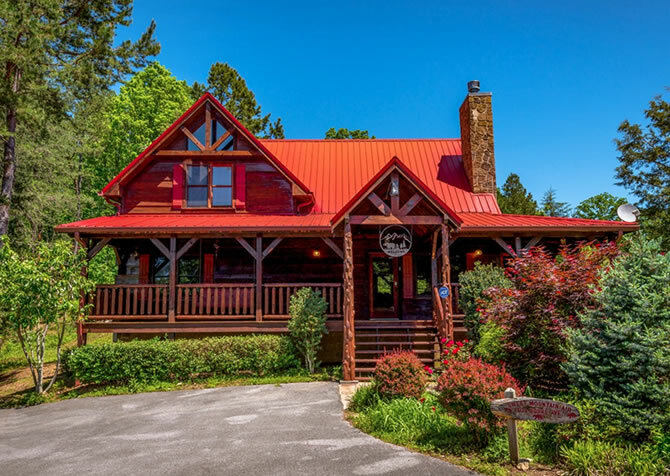 An amusement park made for the Smokies, Dollywood centers around family fun, with daring rides, musical shows, animal exhibits, and country cookin’. 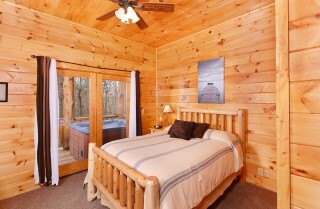 "Great Escape was absolutely wonderful! 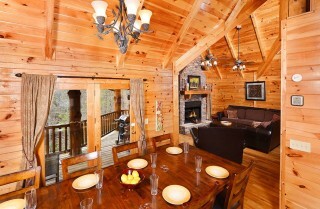 It was spacious enough for 8 adults and had great amenities! 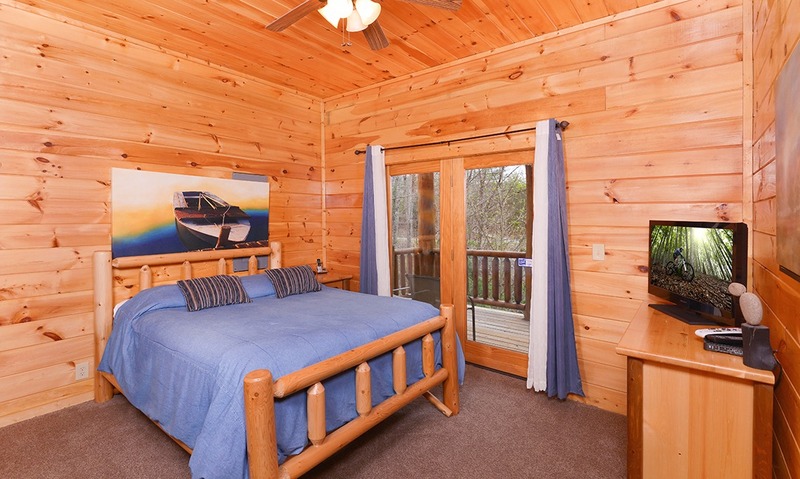 The pictures of the cabin online look identical to how the cabin actually looks, which is not always the case with most lodging photos online. 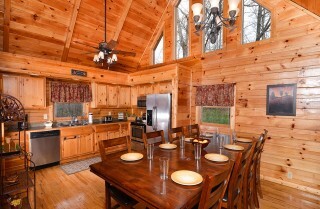 I would recommend this cabin for small family reunions and couples trips!"